Classic round body step can. Opens smoothly and closes quietly. Tight fitting lid seals in waste and odour. External non-slip foot pedal provides easy hands free opening. Perfect for kitchen bath or office. Honey-Can-Do TRS-01447 Oval Stainless Steel Step Trash Can. A contemporary addition to any home or office, this 12L (3.2 gallon) trash can boasts sturdy construction for daily use. The steel foot pedal provides hands-free operation to keep germs at bay. A plastic inner trash bucket is fully removable for easy emptying and cleaning. The brushed stainless, hand print resistant exterior is easy to clean and features a plastic fold down carrying handle. Honey-Can-Do TRS-02111 Step Trash Can, Matte Black. A sleek addition to any home or office, this 30L trash can boasts sturdy construction for daily use. The coated steel foot pedal provides hands-free operation to keep germs at bay. An inner buckets keeps bags (optional) from snagging and is easily cleanable. The deep recessed lid, hides trash bags from view. The hand print resistant exterior is easy to clean and features a metal fold down carrying handle. 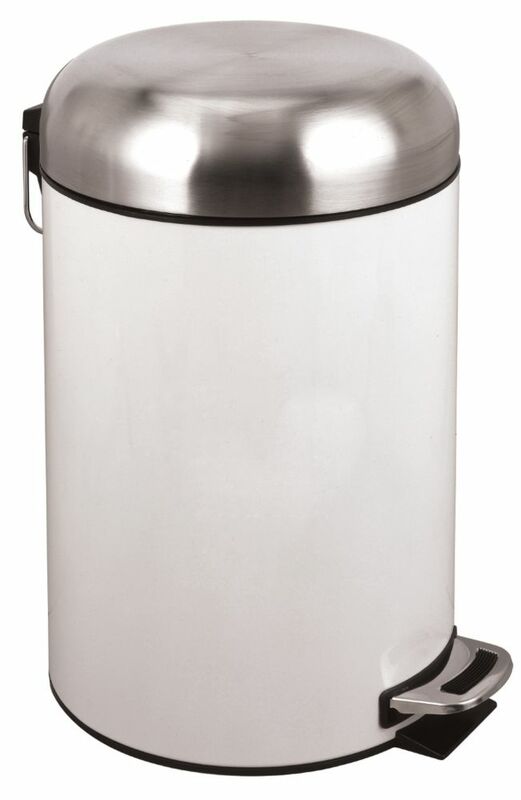 Honey-Can-Do TRS-02110 Stainless Steel Step Trash Can. A contemporary addition to any home or office, this 30L trash can boasts sturdy construction for daily use. The steel foot pedal provides hands-free operation to keep germs at bay. An easily removable inner bucket keeps bags from snagging and is easily washable. The matching stainless steel lid hides trash bags from view. The hand print resistant exterior is easy to clean and features a metal fold down carrying handle. 30 L White Enamel Dome Lid Style Step Can Classic round body step can. Opens smoothly and closes quietly. Tight fitting lid seals in waste and odour. External non-slip foot pedal provides easy hands free opening. Perfect for kitchen bath or office.